If you consider that the greatest vehicle for the survival of a culture lies in the perpetuation of its language and arts, then the contribution of King David Kaläkaua (1836-1891) to today’s identity of the Hawaiian culture is monumental. Through his revival of hula, lua (Hawaiian martial art), the Hawaiian language, and Hawaiian mele now almost one hundred and fifty yeas ago, he has safeguarded passage for this “culture vehicle” into the future. 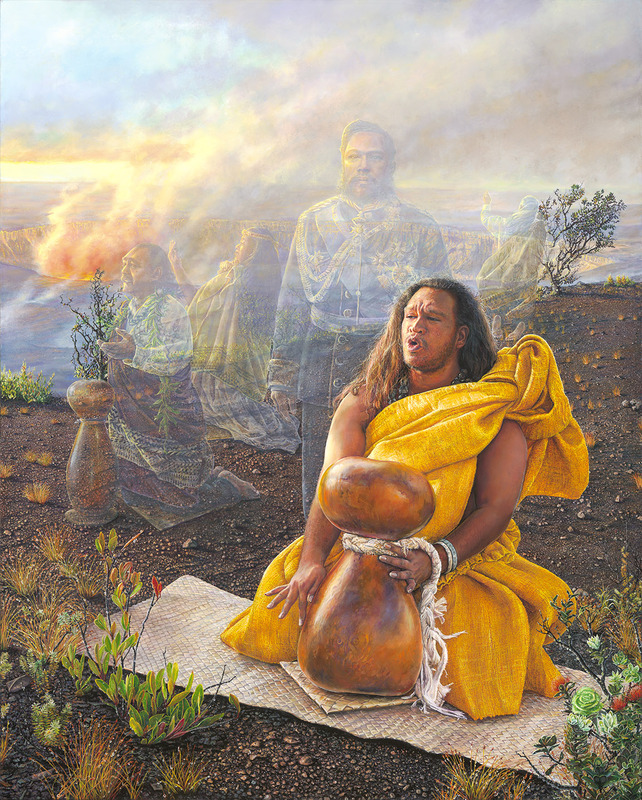 From the first verse in the name chant Kalākaua, Ka Pua Mae’ole i ka Lā refers to his ongoing legacy – the restoration of pride in all things Hawaiian. Dubbed “The Merrie Monarch” because of his flamboyant love of drinking, gambling, music and dance, King David Kalākaua created quite a stir of disapproval over his extensive travel abroad, extravagant spending and lavish entertaining. Six years into his reign as the first elected King of Hawai‘i and despite the criticism of many, he built ‘Iolani Palace (1882). Although he and Queen Kapi‘olani used several residences to grandly entertain, ‘Iolani Palace has the distinction of being the only royal palace existing in the United States of America. Hawai‘i’s only elected monarch David Kalākaua and noted patron of culture and the arts was born David La‘amea Kamanakapu‘u Mahinulani Nalaiaehuokalani Lumialani Kalākaua. He was descended from Kona chiefs who helped Kamehameha I in his consolidation of all the islands into one kingdom. He was the last King of the kingdom of Hawai‘i, reigning from 1874 until his death on the mainland in 1891. As king, Kalākaua was faced with the decline in the population of the Hawaiian people, the curtailing of the power of the monarchy, and the increase in foreign control and ownership of Hawaiian lands. Being deeply concerned about native Hawaiian culture and traditions being lost, he sought to ensure an identity for this beloved Hawai‘i nei through the restoration of public hula performances (previously denounced by missionaries earlier in the century as “sinful” and ultimately banned in 1830 by Ka‘ahumanu after her Christian conversion), Lua, surfing, and the Hawaiian language (he was fluent in both English and Hawaiian and encouraged the transcription of oral traditions). He was a great proponent of the music of the Royal Hawaiian Band (founded by Kamehameha III), was a talented musician himself and composer of Hawaiian mele (collaborating with the bandmaster of the Royal Hawaiian Band to write Hawai‘i’s state anthem: Hawai‘i Pono‘i). He enthusiastically supported the use of the ukelele (quite new to Hawai‘i at his time but today now closely associated with most Hawaiian music). …and you are looking at a living, “morphing” monument to one king who loved to party!